Dr. Levy is one of the most widely known and respected retina surgeons and vitreous specialists in South Florida. A native of Miami, Dr. Levy received his medical degree from the University of Miami and completed his internship at Jackson Memorial Hospital. He served as Chief Resident during his Ophthalmology Residency at Sinai Hospital of Baltimore, in association with the Johns Hopkins Hospital. As a Fellow in Vitreoretinal Disease and Surgery, Dr. Levy received additional subspecialty training at White Memorial Medical Center in Los Angeles. 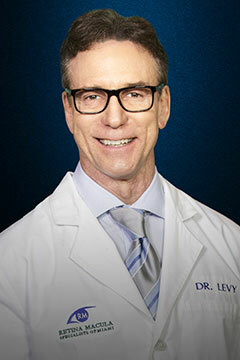 Dr. Levy is a Diplomate of the National Board of Medical Examiners, a Board Certified Ophthalmologist and a Fellow of the American Academy of Ophthalmology and American College of Surgeons. He is also a member of the American Society of Retina Specialists. He has been published in medical journals, has served as a speaker at national ophthalmologic meetings and was awarded a Travel Fellowship from the Association for Research and Vision in Ophthalmology. Dr. Levy has been recognized as one of America's Most Compassionate Doctors. The Compassionate Doctor certification is part of the Patients' Choice recognition program, where patients rate and vote for their favorite doctors. While physicians generally receive positive feedback from their patients, only a select few receive praise about the compassion that accompanied their care. In fact, of the nation's 870,000 active doctors, only 3 percent were accorded this honor by their patients in 2012. El Dr. Levy habla español con fluidez.